Juan José Navarro is a native of Godelleta in Valencia. He graduated as Profesor Superior of the Clarinet with Honours. He has studied and assisted on various clarinet seminars with teachers such as Jean Luis Sajot, Ramón Barona, Roy Jowit, José Tomás, Walter Woykens and J. Vicente Herrera among others. In 1997 on becoming a teacher in the Conservatorio Elemental de Musica of El Ejido and the Conservatorio Profesional of Córdoba he became a member of the Cuerpo de Profesores de Música y Artes Escénicas pertaining to the Junta de Andalucia. Subsequently he attained his current position at the Real Conservatorio Profesional of Almeria. He has led a number of courses for the conducting of wind band and orchestra with teachers such as Salvador Más, Manuel Hernández Silva, Enrique Garcia Asensio, Jerzy Salwarowski, Paollo Belamia and Cesar Álvarez. He obtained the title of Profesor Superior de Dirección de Orquesta with José Miguel Rodilla in the Conservatorio Superior de Música of Murcia, finishing his studies with the highest possible results and graduating with L´Histoire du Soldat by Igor Stravinsky. 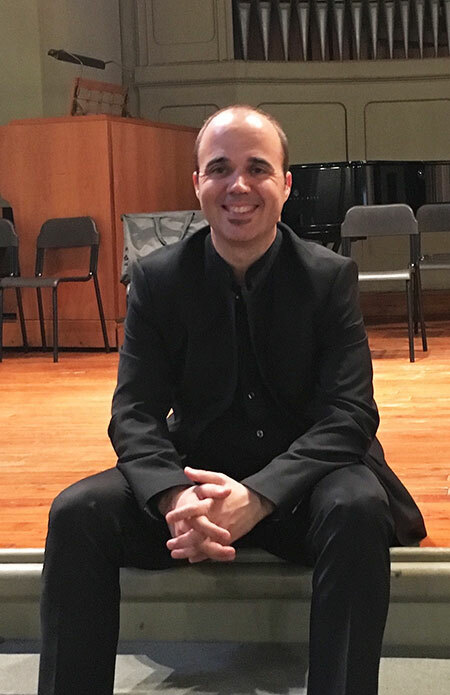 He was nominated by the Conservatorio Superior to perform the duties of assistant director for the Orquesta de Jóvenes de la Region de Murcia. Juan José Navarro has conducted concerts in Spain, Italy, France, North Caroline, Germany, Romania and Holland, with such ensembles as the Orquesta del Conservatorio Superior de Música de Murcia, Sinfónica Municipal de Albacete, Sinfónica San Indalecio de La Cañada de Almería, Sinfónica Municipal de Sevilla, Coral Emilio Carrión, Orquesta Joven de Almería, Sinfónica de la Unión Musical de Godelleta, Oltenia Philarmónic Orchestra ( Craiova ), Orquesta de la Compañía Lírica andaluza, Orquesta de Jóvenes de la Región de Murcia, Sinfónica Provincial de Almería, Orquesta Sinfónica del Conservatorio profesional de El Ejido, Triangle Wind Enssemble (North Caroline), Unión Musical de San Pedro del Pinatar (Murcia), Pitesti Symphony Orchestra (Romania), Banda del Conservatorio Profesional de Música de El Ejido y Ensemble Fiatti di Música Aperta (Bérgamo). He has conducted for many of the productions of the Compaña Lírica Andaluza, such as El Barbero de Lavapiés, Agua Azucarillos y Aguardiente, El Dúo de la Africana…in venues such as the Teatro Alameda of Málaga and the Nuevo Teatro Infanta Leonor of Jaén. He has run courses and given master classes for conducting in Valencia, Virginia Tech University, Murcia, Galicia, Jaén, Granada and Almeria organized by such institutions as the Vicerrectorado de Extensión Universitaria of the University of Almeria, the Federación Andaluza de bandas de Música, the Real Conservatorio Profesional de Música of Almeria as well as for the teaching staff at the Centro de Enseñanza al Profesorado. Juan José Navarro is frequently invited to adjudicate as a member of the board of examiners for composition, wind orchestra, chamber music and best young musician as well as for the National Competition of Wind Orchestra in Murcia, the National Competition of Composition in San Pedro del Pinatar, the Valencia Wind Bands Competition, the UK´s National Concert Band Festival and the National Students Orchestra Competition in South Korea. He got the secod prize conducting the San Indalecio Wind Orchestra in the National Competition in Murcia and the first prize conducting the Unión Musical de Godelleta in the Special Section of the Wind Bands Competition of Valencia. He has been titular musical director for 8 years of the Sinfónica Municipal de Almeria. He is co-founder along with José Miguel Rodilla of the Academia de Dirección de Orquesta y Banda, “Diesis“, which gives classes in Almeria and Valencia to more than fifty pupils from every part of Spain. Currently he is music director of the Sinfónica San Indalecio de Almería, teacher at the Real Conservatorio Profesional de Música of Almeria and conductor of the Symphony Orchestra and Choir at the University of Almeria.